We flew from Hanoi to Kuala Lumpur and spent the night in the airport hotel in KL - even partaking of the hotel restaurant buffet - something we rarely do. Next day we flew into Colombo, the capital of Sri Lanka. We were met at the airport and taken to our hotel in Negombo. There was some confusion regarding our itinerary and after some discussion, our driver agreed he would arrange a tour of the canals in the afternoon - something we had been expecting anyway. Our first experience of Sri Lanka was a boat tour of the extensive canal system, built perhaps not surprisingly, by the Dutch when this was a Dutch colony. Parts of the canals were well maintained as they must have been in the times of the Dutch, but most were in bad shape. The natural canals looked more like a river. We did see some wildlife, although not perhaps as much we had hoped. The locals always seem to be amused by tourists - or at least the kids are. Perhaps they are just being friendly. After our boat ride, we took a quick tour of Negombo. There wasn't a lot to see! Then we returned to the hotel for the evening although we did take a taxi to a local restaurant as our driver was "busy" elsewhere. 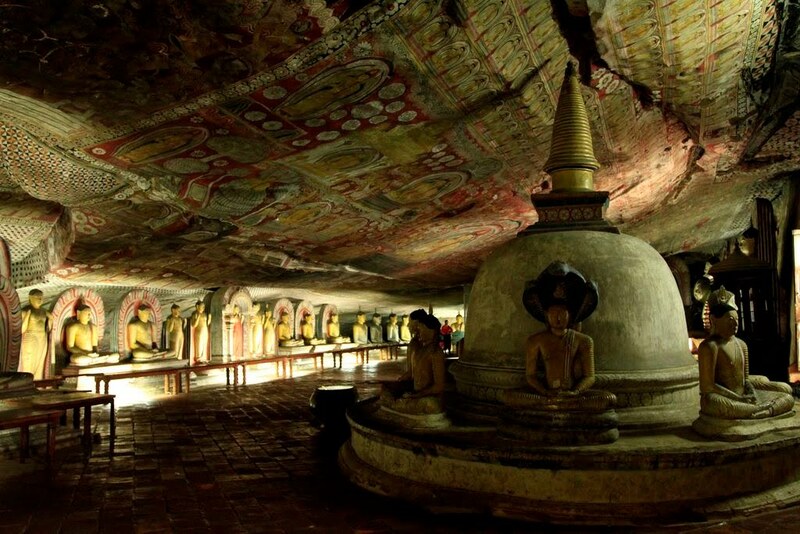 The next day we left Negombo and drove first to Dumbulla to see a cave monastery, The Golden Rock Cave Temple. The caves are actually under a large rock overhang, with walls built to protect the temples within. After Dambulla, we drove to see the Rock Fortress of Sigiriya. This fortress was built in the 5th century by King Kassapa who was expecting to be attacked by his half brother. Indeed, he eventually WAS attacked, killed and usurped by his brother, so his fears were not unfounded. The rock is 660 feet high and THERE ARE NO ELEVATORS. Just ladders, walkways and steps. The 660 foot high rock fortress at Sigiriya. The main town was originally at the foot of the rock but the palace and fortress were at the top. And admire the architecture of the place built on top of this mountain. Imagine carrying all those bricks up the mountain by hand ! Going down was much easier than coming up, as you might imagine (which is why I'm smiling). And from here, we drove on to Habarana for an overnight stay. Next day, we took a tour through the local fields and waterways. To quote our tour itinerary " You will experience the simple lifestyle of our native culture. Stop for lunch and be treated to delicious local cuisine". So we started with a bullock cart ride! They made us silly hats made with lotus leaves, which we felt obliged to wear, even though we both had perfectly good hats of our own! After our boat ride, we disembarked and walked through the fields to a small hut with a lookout tower built into a tree next to it. The look out is used at night to watch for elephants which damage the crops. The locals frighten them away with fireworks. Kris went up the ladder to the first level but decided that was high enough. I climbed all the way up! Then on to our last stop for lunch , watched over by the owner of the establishment, who doesn't look very happy. On our way to our next site, we did see elephants in the distance. You can tell they are Indian elephants because they are smaller and have small ears. Later in the afternoon, we visited Polonnaruwa, which is a World Heritage Site and was the capital of Sri Lanka from the 11th to the 13th century. The buildings are very impressive and illustrate very well how powerful and sophisticated these kingdoms were almost 1,000 years ago, but on a hot day, walking around ruins like these can get old very quickly! A Buddhist temple. The Buddhas face the entrances to the temple, which point north, south, east and west. A giant stupa. Stupas are solid although small chapels (like the one show here) are carved into the base. The next day we left for Kandy, which is famous for the Temple of the Tooth. The Tooth (of Buddha supposedly) is a sacred relic. Our hotel, the Cinammon Citadel, was a little unusual because each room consisted of a small, private bungalow. After checking in, we went to explore the Temple of the Tooth. The outside is very impressive, with a moat around it. More like a palace than a temple, which it was at one time. This was originally built as a fortress and a palace and the walls are very wide and strong , with a moat. Terrorists have attacked the temple twice at the end of the 20th century. The relic (the tooth) or at least the gold container holding the tooth, is shown three times a day and it gets VERY crowded as everyone is herded along. It's a mixture of pilgrims and tourists although it's hard to tell them apart. The tooth is held in a gold casket (actually six gold caskets nested inside each other ) at the back of a small shrine. You just about have time to glance in before you are moved along. 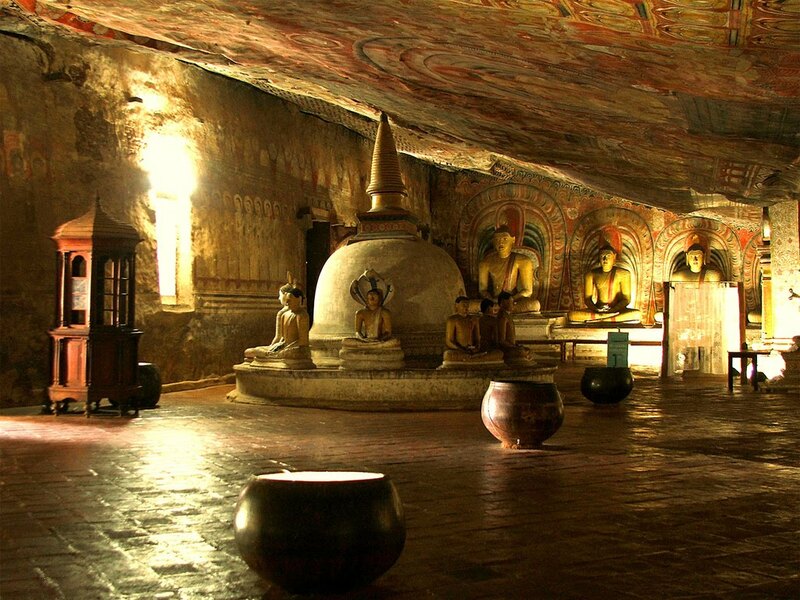 The tooth was originally brought to Sri Lanka in the 2nd century AD, but has been kept and hidden in various locations since then. The tooth is thought to have great power and the ruler of the kingdom would fight to get and keep the the tooth, so validating their position as ruler. The Buddhist Shrine Hall, containing dozens of seated Buddha figures. The 19th century audience hall inside the palace grounds. After leaving the Temple complex, we went to see a Kandyan Cultural Show, meant just for tourists. It was so poor we left about half way through. We only spent one night in Kandy and the next day we headed out with the INTENTION of doing some white water rafting.